Deer Hunters Fined $5,000 for Trespassing. A group of hunters have been fined a total of $5,000 for offences under the Fish and Wildlife Conservation Act. Norman Pond of Newtonville, Edward Pond of Oshawa, John Pretty of Courtice, Pat Keefe of Pickering, and Terry Parr of Sault Ste. Marie, pleaded guilty and were each fined $1,000 for hunting white-tailed deer on a property without written permission. Court heard that during the open rifle white-tailed deer season on Manitoulin Island in November 2012, the hunting party entered onto properties adjacent to their hunting property without the required written permission and over the week harvested four white-tailed deer. Justice of the Peace Darlene Haden heard the cases in the Ontario Court of Justice, Gore Bay, on February 7, 2013. 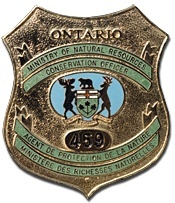 The public is reminded that when hunting white-tailed deer on Manitoulin, Barrie and Cockburn Islands it is a requirement of their licence to possess written permission for all areas intended to be hunted. To report a natural resources violation, call 1-877 TIPS-MNR (847-7667) toll-free any time or contact your local MNR district office during regular business hours. You can also call Crime stoppers anonymously at 1-800-222-TIPS (8477). ← Illegal Trade In Turtles Results In $1,950 Fine.